Prime Minister Nguyen Xuan Phuc sent the best wishes to armed forces and residents in Da Nang while visiting the central city on February 5, the first day of the Year of the Pig. At the Da Nang Military High Command, he extended the Lunar New Year (Tet) greetings from Party and State leaders to officers and soldiers of the armed forces in the city, asking them to uphold their traditions to fulfill every task assigned by the Party and State. Appreciating the forces’ achievements, he noted that Da Nang holds an important role in the implementation of Vietnam’s maritime strategy in the central region. He requested the forces enhance their coordination, stay ready to respond to any circumstances and carry out the mass mobilisation work well so as to win more people’s trust. The Government leader also asked leaders of armed forces units to better care for the life of their officers and soldiers who are on duty during the Tet holiday. 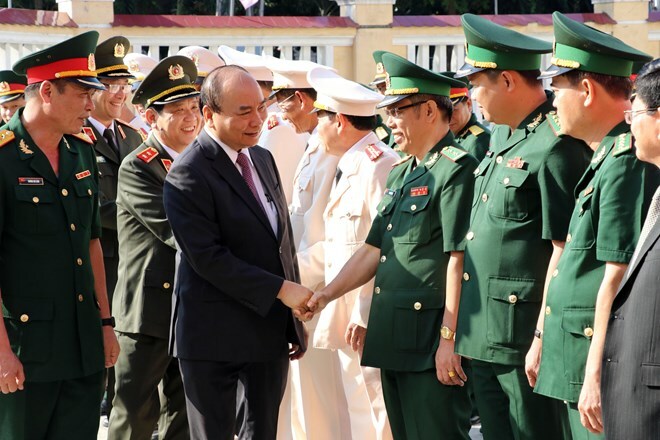 Col. Truong Chi Lang, Commander of the Da Nang Military High Command, reported on the local armed forces’ attainments in 2018, elaborating that they successfully ensured political security and social order, safeguarded the country’s sovereignty at sea, and helped strengthen civil-military relations. They have been seriously performing their tasks during the Tet holiday, he said, adding that Tet wishes and gifts have been offered to officers, soldiers and people with disadvantages in Da Nang. Also on February 5, PM Phuc visited and extended Tet greetings to officials and residents in Thuan Phuoc ward of the city’s Hai Chau district.